Posted by Crazy Mermaid in Involuntary Committment, Mental Hospital, Uncategorized. NAMI (National Alliance on Mental Illness) has a few signature programs for people living with a mental illness. One such program is a series of 10 classes called Peer to Peer. The classes are designed to help people with a mental illness understand their illness better and build a fulfilling and satisfying life. All classes and programs are free, and are led by volunteers. The Peer to Peer class is led by two people who are successfully living with a mental illness. NAMI Snohomish County is holding their first ever Peer to Peer class, and last night was Class 9. In that class, we discussed a stay in the mental hospital, which most people in the room were familiar with, including me. The focus was on the “rules” of the stay. Some are known, and some are not. One of the biggest “rules” was how long the stay was going to be. Although there are guidelines, there are no hard and fast “rules”. During my hospital stay, I was told by several patients who had been in the revolving door of the hospital that their average stay was 2 weeks. But no one in authority gave me any indication of how long I would be there. When I point blank asked my psychiatrist daily, he was cagey about this point. He wouldn’t even give me a ballpark number. I was held, against my will, in a mental hospital and no one would tell me when I could leave- or even what I had to do in order to be released. In the days before I was involuntarily committed, I was supposed to be helping my best friend, Becky, move from her home in Washington to Minnesota. But as the day of her move got closer, my psychotic episode worsened. I was supposed to help her drive back to Minnesota the day I was hospitalized. In retrospect, the added stress of her move was the straw that broke the camel’s back. But the nature of my psychotic break was such that I suppressed the memory of helping her move. Unfortunately for me, about all my psychiatrist had to go one was this one thread of information. My husband told the people at the hospital emergency room that I was supposed to be helping my friend move, so that’s what went on my chart. My psychiatrist read the chart, and, absent much else, laser focused on that one fact and built a treatment plan around it. Day after day, my psychiatrist tracked me down and asked me the same question: Who was I supposed to be helping move? I was bewildered by this question. I had no memory of anyone I knew moving, much less helping anyone move. After a few weeks of this, I figured out that the answer to the question was my passport out of the place. But I couldn’t figure out the answer, much as I tried. My mind was blank. Eventually, I came to believe that my husband and sister were having an affair (not true), and that they were keeping me locked up so they could continue. I even told my theory to my psychiatrist, who didn’t seem convinced. After every one of our “sessions” where he asked me the question, I asked him when I was going to be released. He told me he didn’t know, but that I would be there awhile longer. I realize now that my psychiatrist was using my ability to remember that event as some kind of “wellness” gauge. In his defense, he had very few tools at his disposal. All he knew was what was written on my chart. As it turns out, my hospitalization was a good thing, but I didn’t see it that way until months later, when I was in recovery. My civil rights were violated, and no one explained why. There is no written documentation that I was ever told I was being held because I was a danger to myself or others. And although you aren’t supposed to hold someone involuntarily because they don’t remember who they were supposed to be helping to move, that is in fact what happened to me. Oh yeah: and I wore gold clothes. Apparently my psychiatrist picked up on the fact that I favored gold colored clothes. When I figured this out based on some comments he made, I switched to blue and turquoise colors, and he noticed. But it wasn’t enough to get me released. Even the day before I was released, my psychiatrist told me I would be there awhile longer after he asked me the question I had no answer for. I didn’t believe my court-appointed attorney when she told me I would be released the next day, because my psychiatrist told me something different that morning. I didn’t know who to believe, so I chose to believe my psychiatrist because I thought he had the most power. As it turns out, he didn’t. Although I understand the difficulties of treating someone in my condition, I feel my case was mismanaged. Posted by Crazy Mermaid in Mental Hospital, Psych Ward. NAMI (National Alliance on Mental Illness) has a program called In Our Own Voice (IOOV), which is a program in which people successfully managing their mental illness go out into the community and talk about what it’s like to live with a mental illness. The one hour structured program is free, and time is built into the presentation for questions. We typically present to churches, nurses, college students, and police officers. 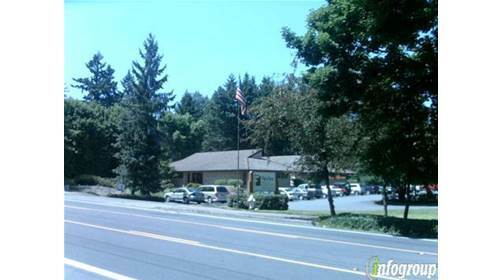 The Redmond, Washington affiliate, called NAMI Eastside, is now offering the program every Saturday to the patients at the mental hospital I spent three weeks involuntarily committed at six years ago. The coordinator for that program solicited help from our affiliate, NAMI Snohomish County, to help man the program, which takes two people to run. She was specifically looking for people who had actual experience in a mental hospital. When she initially approached me to help with the program, I declined. I was uncomfortable with the concept of returning to the place I was locked up at and being locked in again. I was afraid that they might not let me out once they locked me in. Additionally, once I was firmly ensconced behind those locked doors once again, I might regress back to my psychotic state. I always hear voices whenever I get under the stress of doing the presentation, although their questions and comments are benign. Once the presentation is over, they disappear. I talked with my husband about the coordinator’s request, explaining my discomfort. He said he thought it would be good for me to return to the hospital- facing my demons so to speak. He assured me they had no cause to keep me there, and in fact would let me leave if I started to regress. I decided to talk with the coordinator about my concerns, and received reassurance from her that the hospital staff would let me leave if I wished to at any point. She convinced me to give it a chance. Last Saturday was my first presentation back at the hospital. When I arrived, I was surprised that the receptionist desk was in a brand new wing of the hospital. The place was bright and clean, with new furniture and two receptionists behind an enormous curved wood reception counter. When I introduced myself to the receptionist, she asked me my name. She typed it into the computer, and I half expected her to ask me if I had been committed there. But she didn’t. She pointed to a camera on her desktop, and took my picture so she could make me a temporary badge. I put on the badge and waited on a new leather couch in the brand spanking new waiting room for a staff member to take me to the presentation room. In the meantime, my co-presenter arrived and received his badge. The staff member arrived, with four patients in tow, and took us to a conference room in the new section of the building. But the conference room was being used, so we were shuffled from the new section to the old section, into a craft room. Same old white tile, off white walls, stained craft tables, and uncomfortable chairs reminded me of my stay there. I was surprised to see a craft room, complete with plastic beads, painting supplies, colored pencils, and games, because when I was hospitalized, six years ago, they brought the craft stuff to us. We weren’t allowed out of the ward. As we passed locked ward doors down the corridor, each had a sign like you find when you enter an area with a high fire danger. Instead of “Fire Danger” the sign read“Likelihood of attempt to Escape”. Choices were High, Medium or Low. Two wards had a high likelihood of escape attempts, and one had a low likelihood. I don’t remember any such signs when I was there. I didn’t ask to see my old ward, and I didn’t recognize any of the staff. I was pleasantly surprised that two of the patients had more interesting questions about hearing voices, but they related better to my co-presenter than to me, because their path into the hospital was via suicide attempts. Nobody claimed to hear voices or have delusional thoughts, and I didn’t expect that to happen. Those people would not be allowed out of the psych ward. I ended up staying for the entire presentation, and I’m pleased to say I didn’t feel like I had to leave before the presentation was done. I wouldn’t hesitate to return. Posted by Crazy Mermaid in Mental Hospital, mental illness, Psych Ward. 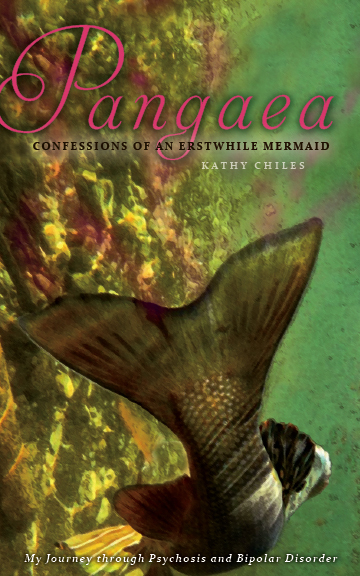 My memoir, Pangaea: Confessions of an Erstwhile Mermaid, is now available in softcover at Amazon. Here is the link: http://www.amazon.com/dp/1483908550/ref=rdr_ext_tmb. Writing the book was a cathartic process that helped me in my recovery effort. The book idea started with my mother when I first was released from involuntary commitment at the mental hospital. Riding in the car with my parents after my release, I decided to tell them about some of my beliefs and thoughts. My mom was visibly disturbed by my revelations, and encouraged me to write my thoughts down, suggesting that I might want to write a book about my experience at some point in the future. A seed was sewn. Once I decided to write the book, I found that writing about my psychotic thoughts put me back into the beginning of my psychotic state of mind. When I felt the dangerous pull of psychosis while I wrote, I stopped writing for a day. When I started to write my story, I had no idea how I had landed in the mental hospital. I didn’t remember the thoughts and actions that got me there. So I started with what I did remember, which was my actual hospital stay. Then I started, little by little, to remember the events prior to my involuntary commitment. As I continued writing my story, each time I remembered more of what happened. Writing my story was easy for me once I began remembering the thoughts and actions that got me committed. It was like watching a movie unfold in front of me. All I had to do was write what I saw on the screen. Entire conversations and pictures came flooding into my mind. The psychedelic colors I saw during my psychotic break were as vivid on the screen in my mind as they were when I was psychotic. I saw the green skin of merpeople in my mind’s eye. I felt the flaps of skin between my toes that were my fins. I heard the timbre and pattern of speech my dog used when he talked to me. In case you would rather purchase the ebook, it is available at Amazon at this link: http://www.amazon.com/Pangaea-Confessions-Erstwhile-Kathy-Chiles-ebook/dp/B00BZZ8R18/ref=sr_1_1?s=digital-text&ie=UTF8&qid=1409943741&sr=1-1&keywords=kathy+chiles+ebook. For Barnes and Noble’s nook, here is the link: http://www.barnesandnoble.com/w/pangaea-kathy-chiles/1115285887?ean=2940016728599. From the comfort of your armchair, come with me on my journey to insanity and back. It’s a fun journey for the most part (what’s not to like about being a beautiful, smart, rich mermaid?) , and the end fills you with hope for the people living with mental illness and their friends and loved ones. Enjoy! Posted by Crazy Mermaid in NAMI. Back on May 28, 2008, I was locked up at a psych ward in a mental hospital and stripped of my civil rights. All the doors were locked, and no one would tell me what I had to do in order to leave. My stay centered on how long a particular psychiatrist, Dr. Suh, thought I needed to stay. What I needed to do in order to get released was a mystery that no one explained. After a few weeks of being locked up, I came to believe that my husband was the source of my problems. I was sure he had me locked up because he was sleeping with my sister, and he didn’t want me in the way of their budding romance. I explained my theory to Dr. Suh, but he didn’t believe me and wasn’t about to release me. This scene played out for three long, agonizing weeks. Each day Dr. Suh asked me stupid questions, and each day I gave him my answers. But they were the wrong answers, because he never would tell me that I was free to go. Finally, after three weeks, my court appointed attorney, whom I hadn’t seen since my commitment hearing three weeks prior, showed up and told me I was being released the following day. Since Dr. Suh had just indicated hours earlier that he wasn’t going to release me, I didn’t know whom to believe. Was Danica, my attorne,y right and I was being released, or was Dr. Suh right and I was staying? I planned for the worst but hoped for the best. The following morning, my caseworker, Michelle, summoned me to a stifling little room and told me I was leaving. She had me sign some paperwork (I actually was unable to write my name but that didn’t seem to matter) and then brought my husband into the room. At that time, she told me I should go to a support group sponsored by National Alliance on Mental Illness (NAMI). She said it was a group therapy kind of environment, and that only people with a mental illness could go. She indicated that attending that group would help me stay out of the mental hospital. I was all ears. I was indeed released that day, and reveled in the freedom of not being locked up with no end in sight. I took Michelle’s advice and attended the support group, called NAMI Connections. My husband had to drive me to the meeting, which was held at Crossroads Mall in Bellevue, WA, because I was physically unable to drive because of all the drugs they had pumped into me at the hospital. Once we arrived at the meeting, he left me at the door and Victoria, the co-facilitator, took me in hand. For reasons unknown to me at the time (but subsequently realized were induced by my medication), I started crying hysterically and couldn’t stop. Once the group started, Victoria led me out of the room and stayed with me while I tried to get control of my crying. The meeting only lasted 90 minutes, and I took up about half an hour of it with my crying jag. Finally, I got control of myself and we returned to the group. Once there, I was surprised at the number of people who had spent time at a mental hospital. In that environment, it wasn’t unusual at all. Many of the attendees could relate to my three weeks of being locked up. I felt good knowing that there were people in that room who understood what I had gone through. I felt a comradeship with them. Once my medication started to kick in, my psychosis left me for the most part (I still hear voices when I get under stress), but I have continued to attend these support groups because of the fact that there are others like me there, dealing with the same problems I have. I don’t feel alone. As I got better, I started getting more involved with NAMI. Now, I run a Connections support group and speak at colleges, hospitals, and police stations to audiences about what it’s like to live with a mental illness on a daily basis. That program is called, appropriately for me, In Our Own Voice, and it helps to put a face to mental illness in order to break down some of the stigma surrounding mental illness. Posted by Crazy Mermaid in Involuntary Committment, Mental Hospital. An article Thursday January 23, 2014 about boarding at Evergreen Hospital in Kirkland, WA, gave me hope for the future of treatment of mental illness in hospital emergency rooms. . http://seattletimes.com/html/localnews/2022721653_boardingupdatexml.html. I had my own horrific boarding experience with this hospital in May of 2008. Boarding is the practice of “storing” someone in a mental illness crisis at the hospital while waiting for someone with a mental health background to do a diagnosis and find treatment for the person in crisis. At the time, Evergreen had no one on staff to do the assessment, and it sounds like nothing has changed in the past 5 years. This lack of staff caused major headache and expense to everyone involved. When I went to the emergency room at Evergreen, not one person with a psychiatric background, except for the Designated Mental Health Professional (a King County employee) interviewed me during my crisis. All the hospital personnel did was lock me in a white room by myself for hours. They kept me locked up alone until the on-call DMHP arrived, which was approximately 7 hours after I got there. After hours of isolation with no explanation about what was going on, I became more agitated, as anyone in my circumstances, mentally ill or not, would be. Locked in a room, isolated, with no explanation about what was going on, my delusions and hallucinations got progressively worse. I started to believe they were irradiating me, with the intent of killing me. That was, in my mind, the explanation of why they didn’t feed me during my day-long stay. After hours of contemplation, I finally thought of a plan to get out. I got them to allow me to use the restroom, then broke away into the emergency waiting room yelling “fire” in an attempt at escape. This effort failed miserably. I understood my rights, and I knew they had no legal basis whatsoever at that point to hold me. I refused to sign the paperwork that would have checked me into the hospital, and I knew they couldn’t legally check me in. And yet they locked me in a room. What was I supposed to do? At that point, I had done nothing dangerous. My only “crime” was thinking I was a mermaid, which was not a violent thought at all. People don’t associate mermaids with aggression, and I didn’t give the hospital staff any reason to consider me dangerous. Even taking my clothes off in the emergency room didn’t pose a threat to anyone. It was a sign of poor judgment- nothing more. It was only after I had been locked in that room for several hours, with no explanation about what was going on, that I decided to throw the furniture at the wall in a misguided attempt to gain my freedom. Had I been given any kind of explanation by the staff, any communication by them, about what was going on, I probably wouldn’t have thrown the furniture at the wall. At the point I threw the furniture at the wall, I was declared a danger, which was my ticket to involuntary commitment. I could likely have avoided involuntary commitment had I been seen by a psychiatrist at the emergency room. I would at least have had a chance. Hopefully, with the changes Evergreen is being forced by the Federal Government to make, they will have a psychiatrist on staff to interview people in the middle of a psychotic episode, and treat them more humanely. After the DMHP declared that I was to be involuntarily committed, which was about 6 pm, the hunt for a mental hospital bed was on. In the meantime, I was kept locked in that white room, with no contact with the outside world, and with no explanation about what was happening. They should have at least made an attempt to tell me the plan. At about midnight, three people walked into my locked room with a red four point restraint board and directed me to “hop on”. There were straps erupting from all directions on that board, and I knew instinctively that they were going to strap me down once my head hit the board. So I refused to jump aboard. Upon my refusal, two security guards came at me, one grabbing me by the throat and slamming my head down on the board. He choked me so hard that he cut off my air supply. I screamed. The other security guard buckled me into the restraint board. After he finished, a nurse came at me with a syringe and plunged it into my thigh. I woke up the following morning in a room with a bed bolted to the middle of the room, and no other furniture. I had no idea where I was or what had happened. As it turns out, I had been involuntarily committed to Fairfax Hospital in Kirkland. Even when I found out where I was, I knew nothing about the hospital or the process of involuntary commitment. With proper treatment from the emergency room, I believe this whole scenario could have been avoided. I’m happy to see things might change for the next person having a psychotic break. Posted by Crazy Mermaid in Involuntary Committment, Mental Hospital, mental illness. Finally, things are looking up here in Washington State. Currently, we are 50th out of 50 in terms of mental hospital beds per capita for the State. Two new mental hospitals are scheduled to be online within the next few years. A 68 bed facility at Fairfax Hospital, where I was involuntarily committed, broke ground in May of this year. A 75 bed mental hospital, complete with a 25 bed facility for children, is seeking approval for a location in Smokey Point near Marysville in Snohomish County. Currently, Swedish Hospital in Edmonds, with 23 beds, is the only mental hospital facility in the 733,000 person county. And it doesn’t handle children. Bringing these two hospitals online should help reduce or end the practice of “boarding”. “Boarding” is the act of keeping people housed in regular hospitals while waiting for a bed in a mental hospital to open up. This is common in King and Snohomish County because there are too few beds. In King County right now, two thirds of all detentions for involuntary commitment end up being “boarded”- sometimes for days, while waiting for a hospital bed to be freed up. I had my own experience with “boarding” when I was involuntarily committed five years ago. During my psychotic break with reality, I thought I was a mermaid named Pangaea. Life was good in the bubble universe I was in. My friends included Bill and Melinda Gates, Oprah Winfrey, and the Dalai Lama among others. Bill and Melinda provided me with all the money I needed (in my fantasy world), and everyone hung on my every word, telling me how gorgeous I was. And I had ESP. This went on for months. Then things turned nasty. Zombies showed up, with the intent of capturing me. It was at that point that I remembered something I learned in grade school: when your environment isn’t safe, head to a police station or hospital. So I convinced my husband to drive me to a hospital by telling him I was hearing voices. Except I didn’t mean it in the traditional way, but I knew he wouldn’t understand that I had ESP. Feeling my reality dissolving around me, I wanted my husband to take me to the nearest trauma center, Harborview Medical Center in Seattle, but my husband chose Evergreen Hospital in Kirkland instead. Once we arrived, my friends told me via ESP that the hospital was a trap, and I changed my mind about wanting to be there. But I had made an error in judgment by telling my unsuspecting husband that I was hearing voices in an attempt to get him to take me to the hospital. With that confession on his mind, he wasn’t about to let me return home. Once I displayed my fins to people in the waiting room (I could feel the flap of skin between my toes, since as a mermaid I had fins) and took off my clothes in the emergency room, they locked me in a room for hours as they waited for an overworked County Designated Mental Health Professional to examine me to determine whether to involuntarily commit me. That was in the late afternoon. After her examination, she determined that I should be committed (but I didn’t know that). That’s where the “boarding” came in. She finished her evaluation at around 4 pm, deciding to commit me. But where? At that point, she started looking for a bed at a mental hospital. But there weren’t many choices, and they were all full. Not knowing what was going on, I sat in that locked room, for hours. Finally, around midnight, they showed up with a four point restraint board and expected me to jump on and get buckled in. I refused, so they grabbed me by the throat and pinned me down and buckled me in, then came at me with a syringe and plunged it into my thigh. I passed out, coming to in a mental hospital. With new hospital beds on the way, and with some money (thanks to a new tax that goes towards funding for mental illness) to get training for emergency room personnel, the experience I had should become a dim memory. At least that’s what I hope. Imagine having a mental health crisis and finding yourself in a county jail, with little or no mental health treatment, isolated with no direct human contact, in a cell with no toilet or furniture for 23-24 hours a day, wearing only a smock, as days become weeks, then months, all while the symptoms of your mental illness get worse. According to a report, released today by Disability Rights Washington (DRW), this is a recurring problem in local jails across Washington State. Over the last few years, people with mental illness, intellectual disabilities, and traumatic brain injuries have had to wait for several weeks or even months to get an evaluation to see whether or not they are competent to stand trial. If they are found incompetent to stand trial, they often wait additional weeks or months to get services at the state hospital where there is mental health treatment designed to restore competency to stand trial. While they wait in jail, they are held with little or no mental or behavioral health treatment, often under severe punitive conditions for disability-related behavior. This includes being held in isolation, where their mental health often deteriorates. Individuals may be held for low-level infractions, like trespassing or vagrancy, often because mental health services were unavailable. “It is unacceptable that people end up in jail facing criminal charges simply because they cannot obtain the mental health services they need in the community. We are turning these individuals into prisoners when they should be patients,” said Emily Cooper, attorney with DRW. “Jail is the worst possible place for people struggling with serious mental illness. As a society, we need to stop the pattern of unnecessary incarceration of people with mental illness,” said Gordon Bopp, President of the Washington Chapter of the National Alliance on Mental Illness (NAMI). “They are not criminals. Nobody chooses to have a mental illness, and therefore nobody should be jailed for having one. Instead, they should be offered treatment,” Bopp said. Along with sheriffs, mental health providers, judges, prosecutors, defense attorneys, and disability advocates, DRW has worked on this issue through multiple legislative sessions. Last year, the Legislature adopted an aspirational, seven-day performance target for the completion of competency evaluations and state hospital admission for restoration services. The Joint Legislative Audit Review Committee confirmed in a report issued last month that the state hospitals are failing to meet this target, and the time people spend in jail awaiting evaluation and treatment is growing. “The longer a person with a mental health crisis spends in jail, the more devastating and long-lasting the consequence,” said David Lord, DRW Director of Public Policy. “Eliminating the excessive time these individuals spend in deplorable jail conditions must be one of the highest priorities of the legislature,” Lord said. Posted by Crazy Mermaid in Medication, Mental Hospital, Schizophrenia. In a desperate attempt to find a cure for mental illness in the early part of the last century, barbaric treatments were invented. Insulin shock therapy was one such treatment. In insulin shock therapy, a patient was put into an insulin coma six days a week for months on end in an attempt to “cure” schizophrenia by “resetting” the brain. Occasionally that seventh day was filled with electro-shock therapy. Sometimes this “treatment” went on for years. Insulin shock therapy was started by psychiatrist Manfred Sakel in 1927 when he began to use low (sub-coma) doses of insulin to treat drug addicts and psychopaths in Berlin. Interpreting his results as successful, he got the idea of “resetting” the brains of schizophrenics using the same therapy. News of his work spread, and this treatment was picked up by mental hospitals worldwide. After being injected by insulin, patients experienced various symptoms including flushing, pallor, perspiration, salivation, drowsiness, or restlessness before falling into a coma. Each coma lasted for up to an hour and was terminated by intravenous glucose. Seizures sometimes occurred before or during the coma, and these were viewed as positive events. Only the healthiest patients were chosen for the treatment, since it was so hard on their bodies. Broken bones were common. For years, this “therapy” was performed on the mentally ill, including John Forbes Nash, the brilliant mathematician whose life story is told in A Beautiful Mind by Sylvia Nasar. The book goes into a little detail about his treatment. Insulin shock therapy started to fall in disfavor when Harold Bourne, a British psychiatrist, published a paper entitled “the insulin myth” in Lancet in 1953, in which he debunked the therapy. Then, in 1957, Lancet published the results of an experiment whereby insulin shock treatment was shown to be an ineffective treatment for schizophrenia. Over the years, it slowly began to fall into disfavor, and is now thought of as barbaric. It is relatively easy to see why insulin shock therapy was quickly adopted by the mental health community. Up to that point, there was no other treatment available. Anything that had a remote possibility of working was greeted with open arms, and the “science” behind the treatment made perfect sense. “Resetting” the brain would result in curing the illness, they reasoned. Eventually, science caught up with insulin shock therapy, and the medical community was forced to abandon this treatment, but not before much pain and suffering occurred. In the future, it will be interesting to see which of our current therapies are viewed as barbaric as insulin shock therapy and lobotomies are viewed today. You’d think that once a bill gets passed by the House and Senate and signed by the Governor, there would be no question whether the bill goes into effect. But that’s not true. Back on March 17, 2010, I posted a blog entry about the passage of House Bill 3076. I was excited because it would no longer required Designated Mental Health Professionals to disregard evidence given by friends and family members of people with severe mental illness in their decision of whether to involuntarily commit a person with severe mental illness. Prior to this law, the Designated Mental Health Professional could not take into account testimony by friends and family members regarding the mental state of their friend or loved one. Senate House Bill 3076 was a major victory for people with severe mental illness because it enabled them to get much-needed help by enabling their friends or loved ones to give evidence to the Mental Health Professional doing the assessment of the person with severe mental illness to determine whether that person should be involuntarily committed. At the time the bill was passed, I assumed that it would become effective immediately. In fact, I assumed this whole time that it was in effect. That assumption was obviously wrong. Had I read the bill more closely, I would have known that the law wouldn’t become effective until January 1, 2011. I made another assumption as well. I assumed that, once the law came into effect, it would not and could not be revoked. That, too, was an assumption that was wrong. In fact, another bill, Senate Bill 5987, gutted House Bill 3076. I was shocked at this turn of events. Basically, the summary of Senate Bill 5987 changed the effective date of the 2010 statuary changes from January 1, 2012 to January 1, 2015. The reason for the change, said the Staff Summary of Public Testimony, is that there isn’t sufficient treatment capacity to meet current involuntary needs, let alone increased demand. Already, said the new bill, between 25 to 50 percent of all persons involuntarily committed in King County are “boarded” in facilities that are not certified to accept such patients. The legislation, it said, needs to be passed in the special session before the January 1, 2012 effective date of the original legislation. Department of Social and Health Services supports to purpose of the 2010 legislation, but lacks the resources to implement it. Although it is frustrating that the law is now delayed another three years, the reason it was delayed makes perfect sense. It’s yet another victim of our funding crisis.